Passports were needed as nearly 400 guests entered Sacred Heart School’s Monsignor Kennedy Center on Tuesday, November 12, 2013. The normally simple social hall was transformed by the elaborately decorated tables representing different countries of the world. 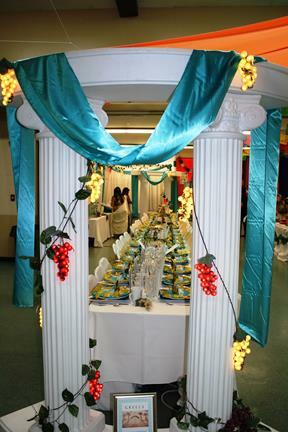 Decorations hung from the ceiling and on the walls enhanced the transformation of the hall. Passports would have been stamped with the country seals of Tonga, China, Japan, France, England, Ireland, Greece, and Mexico. What a whirlwind trip that would have been, but guests only needed to step inside this building at Sacred Heart School to visit all these countries in one event. This annual event is the school’s 53rd luncheon. Sacred Heart School is considered as one of the top educational institutions of the Antelope Valley for Kindergarten through the eighth grade. The meal would have made the Pilgrim and Indians of the first Thanksgiving proud. Turkey and ham surrounded by scrumptious side dishes were served by the school’s eighth grade students. The kitchen crew and supplies for the meals were donated by the school’s generous parents. The annual raffle was a huge success. Many items were donated by businesses of the AV and by many of the school’s parents. The tables are decorated and hosted by the Sacred Heart’s parents, alumni, faculty, and staff. This event is the main fundraiser for the school. It averages over $14,000 each year. The funds are used for enriching the religious, academic, fine arts, music, sports, and technology programs. Sacred Heart School would like to thank all of those who attended the annual fall luncheon and those who donated items for the raffle. With their attendance and donations, the proceeds assist in the education of students who live throughout the Antelope Valley. Your investment in the school makes our community stronger. We are incredibly grateful. If you would like to see additional pictures from the event, log on to the school’s website at www.shsav.org and click on the photo album.